We plan to offer regular open farm hours this summer – details will be listed on our website. Our new and expanded farm store is open varying days/hours throughout the year. Please check our website for current schedule as well as special on-farm events. 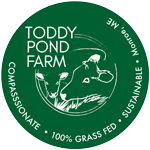 Toddy Pond Farm is a small family operated micro dairy and diversified farm in rural Monroe, Maine. We raise 100% grass fed cows and specialize in artisan yogurts, kefir and ice cream sandwiches made in our on farm creamery. We established the farm in 2012 as a family homestead operation and grew from there. We also raise and sell a variety of pasture and woodland raised meats – chicken, pork, lamb and beef. Our small apiary provides excellent pollination as well as a small season honey crop – available for sale at our farm store. We operate a year round farm stay cottage for those individuals or families looking to experience life on a working farm – we are a four star accredited and Gold member with FarmStayUS. Additionally we offer five weeks of farm camps for kids ages 4 to 11 during the summer months.